Police and paramedics rushed to a call in a McDonald's joint in California's Yosemite region Madera McDonald's but the emergency was of a different kind. A 19-year-old woman went into active labour. There was not much time to take her to the hospital and the area was thus converted into a makeshift delivery spot. Within the next two minutes, a healthy baby boy was born. The delivery went on smoothly and people on the internet are loving the fact that the police and paramedics came just in time to help the young mother. Mozambique Woman Gave Birth in a Tree After Cyclone Idai. Madera Police Department posted a picture of the newly born child on their Facebook page and expressed their gratitude about being able to help. 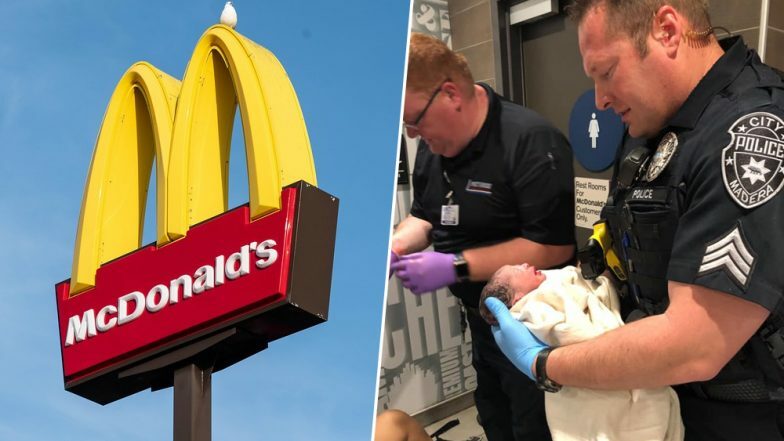 "It’s not everyday you get to help deliver a new born baby at McDonalds," the police wrote in their post and people are feeling all the love. After the birth, the mother and the baby were taken to the hospital and both of them are doing fine. Mother Live Streams Unassisted Water Birth from Home, Delivers Healthy Baby Girl in Bathtub (Watch Video). People on social media expressed love and appreciation on this post. Some even commented on the way the officer looked at the newborn baby. People also found light humour in the situation. Some called in McBaby while someone else the baby should be named Ronald, after the popular mascot. Others wondered if the child will get free McDonald's for the rest of his life. Kevin Carnes, the police officer who answered the call told a news report, his partner Lugo helped the young mother be calm all the while. Suzette Lugo said, "It's definitely one of those things where you go into work and you kind of prepare for the worst and then all of a sudden this comes up and it's like 'Oh yeah, this is a good part. This is what we're doing this for.'" People too have recognised their efforts and praised the police and paramedics for helping the mother successfully.